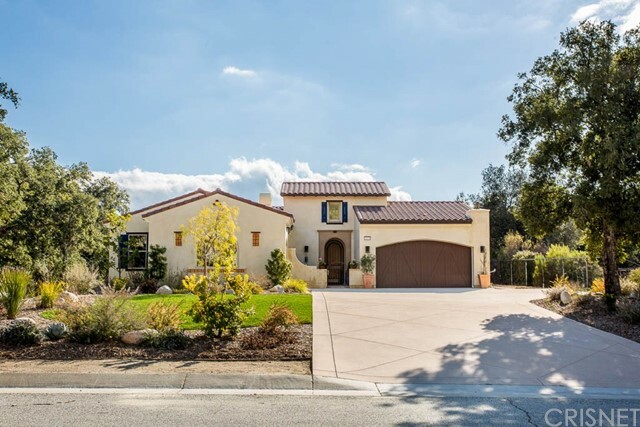 All Canyon Country homes currently listed for sale in Canyon Country as of 04/21/2019 are shown below. You can change the search criteria at any time by pressing the 'Change Search' button below. "HUGE PRICE REDUCTION! Adorned in Luxury, this extremely private and palatial estate sits behind a gated entry atop a hill over-looking the picturesque canyon. As you arrive, the great presence of this astonishing estate is sure to impress. From its shear presence, stately stone columns, and beautiful Mediterranean architecture, to its gorgeous glass and wrought iron entry, the moment you step foot inside, you know you ve entered a one-of-kind masterpiece. Large windows in every room invite endless natural light into the home. Huge voluminous rooms with grand ceilings and custom details throughout create the perfect space for entertaining! This high-tech home includes the best in whole-home automation. The dream garage offers 4-car bays that accommodate 8 cars with auto lifts in each bay. The main floor encompasses the massive great room that includes the open concept kitchen, informal dining area and access to the outdoor entertaining spaces. The downstairs master suite is nothing short of spectacular, with grand fireplace, stone columns, luxurious master bathroom, and a shower large enough for a crowd. The custom wrought iron, spiral staircase and an elevator both lead upstairs to find the game room with wet bar, theater room, gym, office w/fireplace, and 3 more large guest bedrooms, all with en-suite baths. The resort backyard includes a massive pool w/multiple water features, a grotto, slide, color-changing lights, and a secluded VIP area with a 2nd hot tub plus extras." "Undoubtedly, the most Iconic, private, Hilltop Estate in Sand Canyon. This 10+ Acre lot is THE most Premiere view property in the canyon, not to mention, a great value! Options are endless w/ability to build, subdivide, or whatever you dream on this one of a kind property with a split driveway leading to 3 additional flat pads to enjoy as-is or create your own compound. The majestic feeling of being King of the Canyon high above everyone else w/360 views sets-in the moment you arrive at the top of the private drive to this 7,500+ sqft palace in the sky. The unique architecture, abundance of windows, and creative water features add to the spectacular ambiance within the home. This sprawling estate is an extremely impressive, resort-style entertainer s masterpiece. The downstairs master suite encompasses a grand entry and includes an office and glass doors w/direct access to the pool and spa area. Downstairs also offers a guest suite with private entrance, a crafting room, and an additional room for office or gym. Upstairs you ll find 4 more guest bedrooms and a large bonus room perfect for a theater, gym, or game room. The Dolphin shaped pool is enhanced by a large water fountain and flanked by a sheer wall weir fountain that leads your eye from the indoor to the outdoor entertaining area. Huge indoor living spaces are perfect for hosting parties along with endless amounts of outdoor entertaining areas with unmatched views!" "NEWLY REMODELED AND UPGRADED!!! OVER $400,000 RECENTLY SPENT OUTSIDE AND INSIDE. This absolutely spectacular home sits on approx. 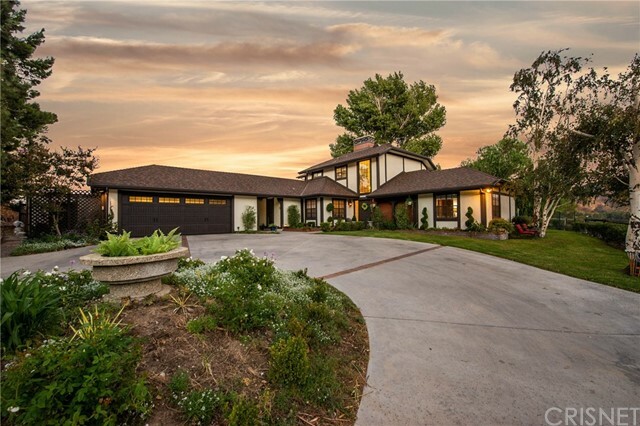 2 flat acres in one of the most sought after gated communities in Los Angeles County, home to celebrities, athletes & successful business people. Located about 30 minutes from downtown and Hollywood. All the 6 bedrooms & 5 1/2 bathrooms are spacious including the office. Some of the amenities include a sit-down bar in the family room w/sink & fridge, walk-in closets in all the bedrooms, new flooring & paint, and maids quarters w/outside entrance. Large kitchen includes a breakfast bar, island w/vegetable sink, Viking 6 burner range, separate refrigerator & freezer, convection oven, mircrowave, 2 drawer dishwasher, walk-in pantry & granite counters. Enormous master bath has been beautifully remodeled w/quartz counters, luxurious appointed shower, tub, sinks, etc. The master bedroom has a private area that can be used to work-out, meditate, as a nursery, etc. The lavish in-law suite consists of a living room w/fireplace, bedroom, bath, full kitchen,& a private entrance. The backyard of this home is beyond comparison. It is an entertainer's dream. The gigantic covered patio has everything incl. a sound system, fireplace, large screen TV, built-in refrigerator, bar-b-q, awesome ceiling fans & lighting. The pool & spa have a unique ozone purification system. A greenhouse, garden area, gazebo, sport/basketball court & sheds included. 4 car garage and RV"
"***Stunning Custom Estate Situated on over 2.2 acres Located in the Lush Heart of Sand Canyon*** Such Attention To detail. From the moment you pull through the Gates the Grandeur is Impressive. This Home has it all. Gorgeous Custom Double Entry Doors lead you into an Luxurious Foyer where you can look past the Beautiful Living room out to the Large Sparking Salt water pool. This inviting home draws you into an ENORMOUS Great Room. The many windows bath the enormous great room with Natural light. The High Ceilings, Heated Marble Floors, Custom Millwork and Custom Lighting make this Home Welcoming and Special. The Kitchen is a Chef's Dream, with Viking appliances and one of the largest, most accommodating kitchen islands you ve ever seen. 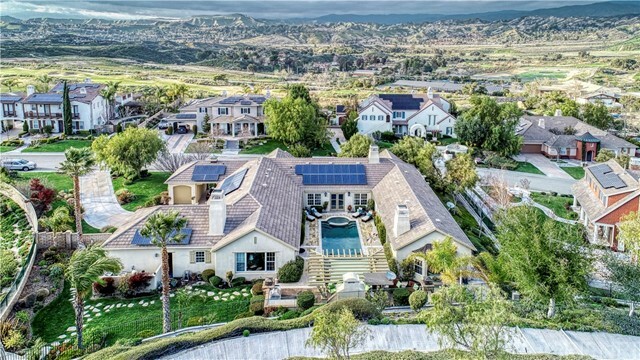 This Custom Estate also offers a Four Car Garage, Expansive Home Office, Impressive Bar with an open concept for all your entertaining needs, Enormous Pantry, Extra large bedrooms, 3 water heaters and the list goes on... In addition to the 1000 square-foot guest house which is situated poolside. The Huge backyard offers a custom salt water pool with a large shallow area for those just wanting to sunbath, 2 Fire Features, an outdoor kitchen with granite countertops, separate pizza oven with a grill and multiple seating areas. This backyard is an entertainer's dream!! ***LOTS of usable land***Close to shopping, dining and great freeway access." "Excellent location for group-home setting, a non-profit, assisted living or a large/extended family. Newly enclosed iron rod fencing with gate. Two homes plus a Studio on a C-3 commercial zoned property, above Sierra Hwy with canyon views. Main home is 4676 sq.ft. with 10 bedrooms, 5 nicely ADA upgraded bathrooms, gorgeous over sized upgraded kitchen with island adjoining the great room. Secondary kitchen/nurses station in south side of home. Two separate laundry areas. Cozy Guest house is approx. 1300 sq.ft. ; 3 + 2, living room with fireplace and dining room; wheel chair accessible. Studio is used as game room; with attached 1-car garage. Fully enclosed pool area with new decking, plumbing, and mountain views. Horse and dog facilities. Well is approx. 2.5 GPM re-drilled to 489 ft. with three water tanks and newer septic systems. A must see property. Room to park 12+ cars & ample room for RVs. Current owners are licensed as a Residential Care Facility for Elderly(RCFE). Many more upgrades." 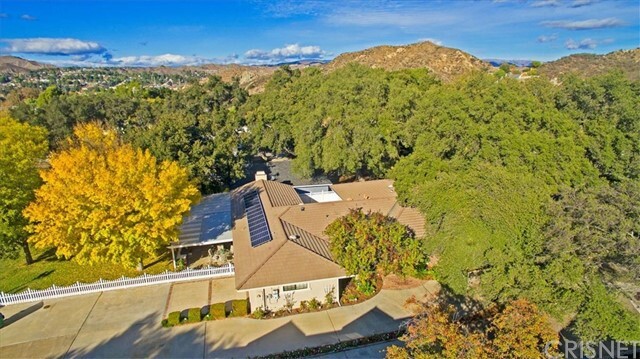 "Welcome to this magnificent remodeled estate in the prestigious gated community of Robinson Ranch! Sweeping entry leads to formal living area with hardwood floors & stone fireplace. Dining room boasts new custom hutch & Butler's Pantry. Travertine floors flow through Chef's kitchen with Quartz counters, custom cabinetry, stainless GE Profile dual ovens, dual dishwashers, built-in fridge, Advantium microwave & warming drawer. New built-in entertainment area with leaded glass & fireplace with travertine hearth accent the majestic great room. DOWNSTAIRS MASTER bedroom presents a peaceful retreat with gas fireplace & sitting area, while the master bath features travertine tile, soaking tub, leaded glass windows & walk-in closet. Two additional downstairs bedrooms share a full Jack and Jill bath, & two upstairs bedrooms offer ensuite baths, roomy walk-in closets & stunning views. Spacious loft with built-in cabinetry is a perfect family room, game room or library. Throughout you'll find rich crown/base moldings & window casings, new window treatments, Peggy Erickson leaded glass windows, new paint, new carpet & more! Private courtyard leads to a charming casitas (ideal place for a quiet office, den, home gym) & oversized three car garage. The backyard is a true oasis with pool, spa, BBQ with island, fireplace, patio cover, new landscaping & the most breathtaking golf course & mountain views anywhere. 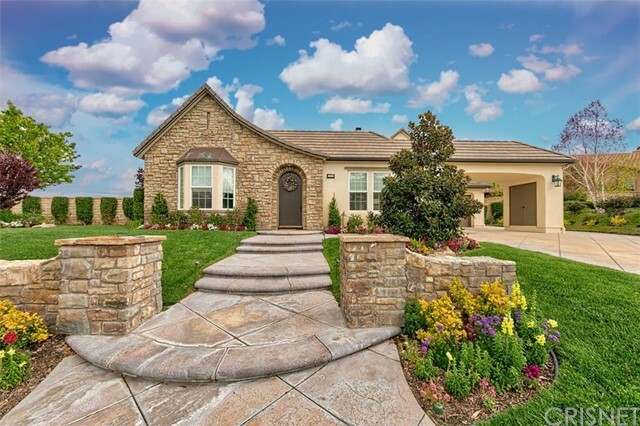 You've found your dream home in 15008 Live Oaks Springs Canyon!" 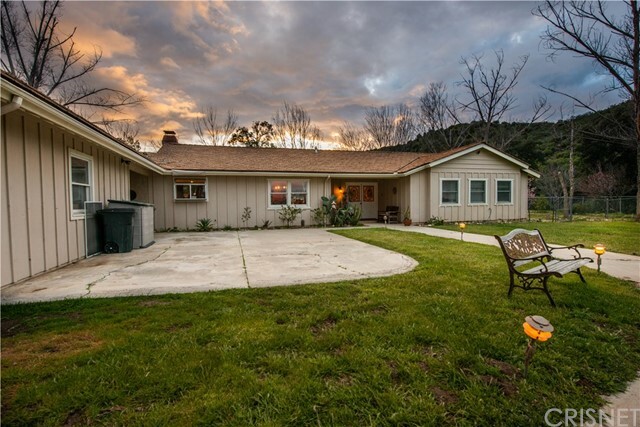 "This Cozy Country Home is nestled in the hills of Sand Canyon Oaks! The home is on 2.68 Acres & also includes an adjacent lot with its own APN with an additional 2.054 Acres. Great opportunity for the investor/buyer who would like to sell or build another home. This custom ranch home has 3 bedrooms, 2 & 3/4 baths, step-down Living room with lovely wood flooring. The Family room has a handsome stone fireplace with raised hearth, beamed ceiling with ceiling fan, track lighting and French doors leading out to large covered back patio & very spacious yard. The Kitchen has tile floors, custom tile & stone work counter tops and back splash, double basin farmhouse sink, Wolf Range & Hood! Formal Dining Room, spacious Master Bedroom Suite with dual sink vanity, shower/tub combo & walk-in closet. The Laundry/Mud Room, just off the kitchen, has two access doors from the outside, 3/4 bath and storage cabinets & utility sink! There is an Outbuilding/Sound Studio located at the back of the property with power on its own meter, there is water up to studio but is not plumbed inside. The property has an 8 zone sprinkler system, two Car Garage, RV Parking, 3 gates for easy access to the property. Vinyl Ranch fencing & pipe fencing w game wire. Electric fencing. The paved street, Mountain Park Road, has an easement for neighbors. The main property has city and well water w 5000 gallon tank. Come make this your retreat!" "Gorgeous single story 5 bedroom 6 bath home in the prestigious Robinson Ranch Community. Offering 4943 sq. ft with 10 foot ceilings. Many windows and French doors to bring in the natural light. Off foyer is the living room with cozy fireplace. Formal dining leads to a spacious kitchen with beautiful granite counters, huge center island with sink and bar stools. Double oven, 5 burner stove, wine cooler and stainless appliances. Kitchen opens to the family room with a fireplace great open concept for gatherings. One bedroom has private entrance perfect for an office or in-laws quarters. Spacious master bedroom has a large walk-in closet, romantic fireplace with French doors leading to the serene backyard. Master bath is a dream with jetted tub, stall shower with 2 shower heads. Double sinks with lots of his and her vanity/counter space. When you enter the backyard you will be in a tropical paradise. An entertainers dream boasting a beautiful pebble tech pool with a raised spa, expansive patio and large fireplace with a built-in BBQ. Backyard also offers a grass yard with a raised sitting area to enjoy views of the beautiful surrounding mountains and valley. Off the master bedroom is another sitting area with a peaceful waterfall and views of the mountains.. This home also features a 2 car and separate single car garage. Solar panels which are leased. As you exit through the private street gate you will arrive at the stunning Sand Canyon golf course. This home truly has it all!" 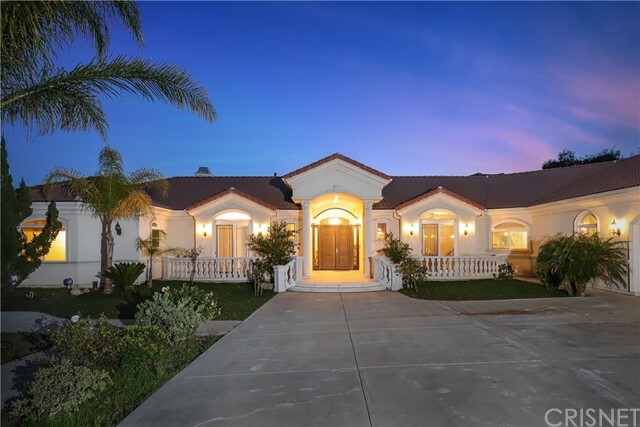 "Exquisite, one story 4 bed / 3 bath Stone Ranch home w detached music studio (2 rooms + bath) totaling 3000 SF on 2 acres in the Sand Canyon neighborhood of Santa Clarita. Privacy abounds! 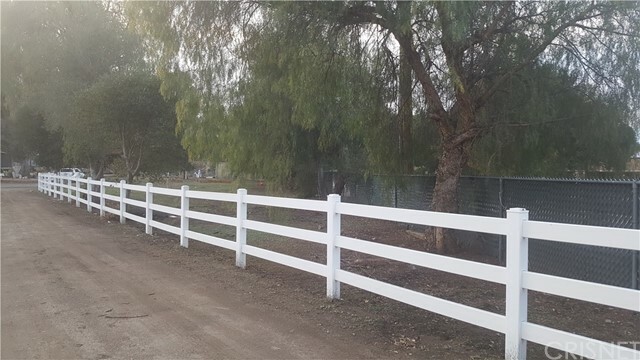 White vinyl fencing accents the gorgeous park like lawns, giant oak & sycamore trees, wisteria covered lanai, stone walls, fruit trees, grapevines, waterfall & fish pond, horse pasture & corral w horse loafing shed. The home features a Viking stove w double ovens, scraped hardwood flooring & mahogany kitchen counters. Six sets of French doors open to gardens, & built in BBQ w fireplace. Enjoy the lovely white bead board covered breeze way betw home & attached 2 car garage/workshop. In 2006, designer Todd Anthony added elegant classic features thru out: stone work, wainscoting, crown mouldings, marble counters, wooden shutters, mahogany &etc. Recently, home further reno d w new roof, new paint, refinishing, energy efficient doors, automatic gates, security system, epoxy floor in garage, additional horse facilities, plus music studio. The detached 730 SF recording studio is insulated & sound proofed, w music playing room, control room, wet bar, energy efficient air conditioner, heat pump & bath w shower. Possibly could be a home office or Mother-in-Law quarters ...or rental cottage." "Welcome to this stunning single story custom home in the 'Live Oak Court' gated community with just over an acre of land! This open concept home features 10 foot ceilings, 4 spacious bedrooms each with its own bathroom. It also features a courtyard in the center of the house with an exterior fireplace perfect for private entertaining or relaxing. The high ceiling, covered patio off the great room was designed for indoor/outdoor living with views to mature oaks and a huge swimming pool size yard . One of the 4 bedrooms has its own private entrance - perfect for guests or an office. It is impressively upgraded with high-end finishes, such as wide plank wood flooring, quartz counters, breakfast nook, a huge kitchen island, a sun drenched living area and so much more! One of the largest lots in this private community. A must See!" "HUGE PRICE REDUCTION! Don't let this opportunity pass you by! This house checks all the boxes. Completely upgraded and remodeled, single story, corner lot, INCOME PRODUCING guesthouse with private entry and an additional oversized 2 car garage, pool, 2 gated RV pads, stunning landscaping, etc. etc. This home has been redesigned and remodeled with lots of love in a well thought out manner. The tranquil and inviting feel is enjoyed throughout the well-appointed spaces in this Spanish/Mediterranean masterpiece. The private, peaceful yard and brilliant landscape, including a small natural stream add to the beauty of this stunning and unique property. Upgrades include roof, electrical (400 amp), plumbing, windows, flooring, additional square footage, larger redesigned kitchen with Viking Appliances, larger master suite with sitting area & walk-in closet, and so much more! The main house is 2,842 sqft with a separate 962 sqft permitted guesthouse, and 1,300 sqft of garage space. Hurry, this won't last!" "This spectacular 5 bedroom 4.5 bath, 3 car garage home provides endless views of Sand Canyon and the surrounding mountains. It is perfectly situated on one and one third all usable acres. Upon entering the home, a grand foyer opens up to an elegant living room with high ceilings, a fireplace, a powder room, and an adjoining formal dining room. The downstairs includes a bedroom/office with its own en-suite bathroom, private entrance, and serene covered patio. The kitchen, which has beautiful granite countertops as well as a butcher-block island, is open to a breakfast nook and family room featuring a wood-burning fireplace. At the top of the circular stairs, you'll be greeted by a multi-purpose loft currently being used as an office. Upstairs are four more bedrooms and three full bathrooms. One of the bedrooms has its own en-suite bathroom. The master suite includes a covered balcony with stunning views, a fireplace, retreat, huge bathroom, and a walk-in cedar closet. The lush entertainer's backyard features a large pool, spa, fire-pit and barbecue area with a gorgeous granite island. There is also an orchard, vegetable garden, and patio herb garden. Enjoy lower energy bills with Sunpower, high-efficiency solar panels that are OWNED and not leased. 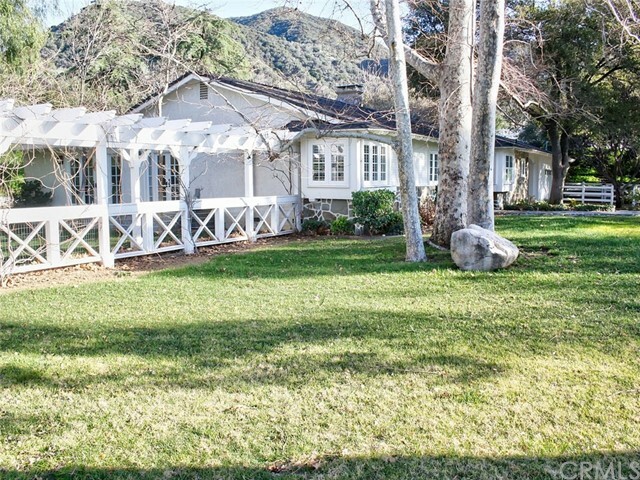 The property's potential includes room for horses, a guesthouse, tennis court, or vineyard. This property is truly a must see." "A truly one of a kind custom built large single story ranch on almost 2 acres located in the peaceful setting of the estates in Sand Canyon. This home has four bedrooms, three and half bathrooms, guest quarters, two car garage, stable, arena, and very tranquil setting. The home has a warm craftsman feel to it and is a true equestrian estate home with top notch facilities and oversized stalls. The flat nearly two acres is bordered by a creek to the east and is very secluded and private. This property has massive lawns that are perfect for large events or weddings. True off the grid living with two wells, solar and a backup generator. Over $500,000 was spent in upgrades. 32 panel solar system, 2 wells with a 10,000 gallon tank, 20 Kilowatt whole house generator, dual pane vinyl windows, hardwood and granite counter tops, monitored alarm system, cameras, dual HVAC, a 300 square foot guest studio off the garage, not included in the 3376 sqft., bringing the total square feet close to 3,700. Dual vanities in the master retreat. Pex plumbing installed recently. Two wood burning fire places. Amazing floor plan for entertaining can accumulate up to 100 people. Large laundry room. Great stable with three oversized 12x24 stalls plus feed and tack room, inside and outside lights, and 5 gallon water troughs. Whether you are a horse lover, want peace and solitude, or want to own property that will accommodate movie shoots and events this property will work for you. Call Today!" "Gorgeous Sand Canyon custom pool home with private entertainer's yard! Open concept home with spacious kitchen/family room featuring white cabinets, light cream granite counters & newer stainless appliances. Wood floors throughout - carpet only in the bedrooms. Full bedroom & bathroom down and an elevator to the second floor should you want to avoid the stairs. Impressive master with french doors to your balcony overlooking the grounds. Saltwater pool with flagstone hardscape & BBQ cook-station perfectly surrounded by the oaks & beauty of the area. Private driveway & parking for multiple vehicles on the property. The 5-Acres include Oaks, archery area, walking trails & total privacy. 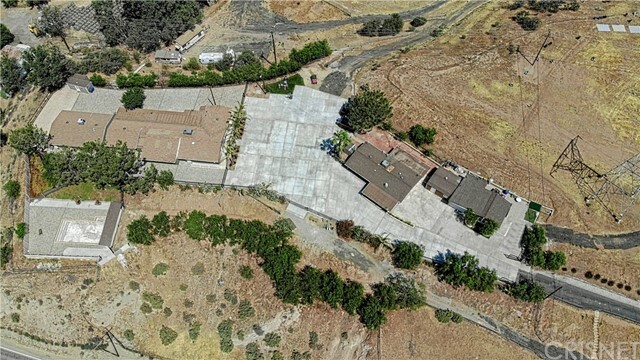 An aerial boundary map of the property is included with the photos and shows the flat lot adjacent to the driveway for...guest house, workshop, extra parking or...? Take either Road Runner or Alamo to Rolling Hills. All roads are paved & the house is terrific!" "HUGE PRICE REDUCTION, VERY MOTIVATED SELLER! Gorgeous updated Luxury Estate in the heart of Sand Canyon featuring beautiful views, nearly 4,600 sqft. with 5 bedrooms, 5 bathrooms, 3 fireplaces, huge upstairs loft, perfect for a game room, and a grand open floor plan designed for entertaining. The moment you enter this prestigious home, you are graced by views in the expansive entry area showcasing the beautiful spiral staircase, and leading to the open living room and formal dining room. Pass through the glass French door entry to the open kitchen, dining, and family room featuring stunning views and easy access to the rear patio. Two downstairs bedrooms offer private space for guests with their en-suite baths. The upstairs master suite features vaulted ceilings, fireplace, balcony and a roomy master bath including a sizable cedar-lined walk-in closet. The backyard features a large pebble-tec pool w/spa, gas fire pit, and multiple sitting areas for entertaining. 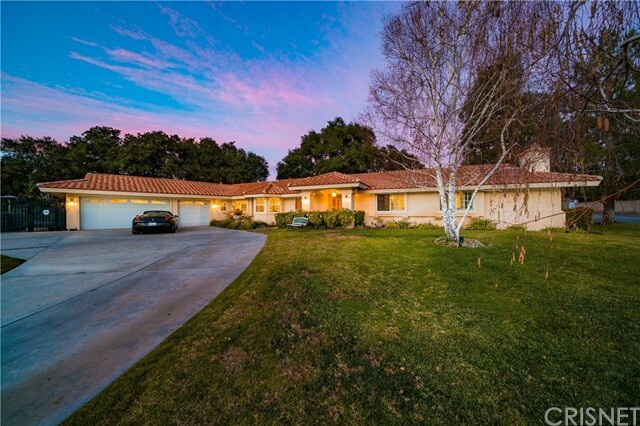 This is truly a rare find in one of the most desirable neighborhoods in the Santa Clarita Valley with an easy commute to the LA area." "Stunning estate home located in the highly exclusive Ridgecrest Estates in luxurious Sand Canyon. This home showcases 6 bedrooms, 4 baths on an extensive 1.67 acre lot! Immediately you'll notice the exquisite curb appeal of this home with a massive stamped concrete driveway, pillar lit walkway and inviting front court yard. Enter through the custom wrought iron doors into the grand foyer highlighted by the impressive iron/wood staircase. The grand living room with cathedral ceilings allows an abundance of natural light to flow through the home. Stroll into the extremely appealing updated kitchen that opens into the warm inviting family room. Beautifully designed with two large bedrooms downstairs, (one converted into an office) with fully updated bathroom. Upstairs the large master bedroom showcases a cozy fireplace, eloquent bath as well as master retreat, currently used as a home gym. Three more expansive bedrooms span the top floor, one currently converted into an amazing home theater/media center. The home is equipped with smart controls which directs the home security/irrigation systems. Come entertain in your private serene backyard! Nestled up to the Angeles National Forest, enjoy the sites and sounds of nature at the custom built fire-pit/sitting area. Take in the views of all Sand Canyon has to offer on the quaint and quiet sitting deck. Gated dog-run and huge gated RV Parking for all your toys! Come make this the home that you've been waiting for!" "Gated Sand Canyon with Multiple Garages! Pristine single story custom with 3420 square feet on over 1 flat acre of land. 3 spacious bedrooms, 3 granite baths, granite kitchen with travertine floors, 5 burner stove, built in refrigerator & room for another refrigerator, and oversized laundry, and an inviting family room that features high ceilings, a wet bar & a brick fireplace. Hardwood floors, ceiling fans, 2 brick fireplaces, 2 air/heat, alarm, reverse osmosis, are a few features plus an expansive covered patio with built in BBQ! Another private patio with lifetime deck and access from master, & from family room! 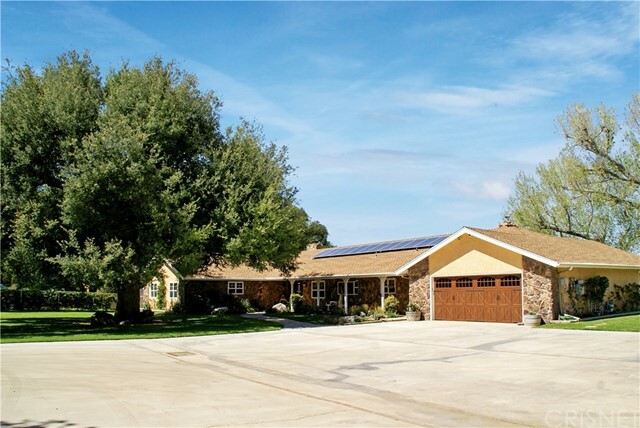 Fully owned solar system, lots of panels-43 to be exact, no lease, just enjoy the benefits! Garages galore- 2 car attached garage to house, then in the back 2 RV garages, 3 more regular garages, additional carport with drive over lube pit, PLUS 1 bedroom ,1 bath, with a loft guest house!!! House is in a cluster community with 3 other homes, all custom & gated and set back from Sand Canyon. True pride of ownership !!!" "Welcome home to this one of a kind gorgeous home with the best 360 view in ALL of Sand Canyon! This Custom Sand Canyon ranch home is situated on top of almost 3 amazing acres of land. Enter through the gate up a long private driveway and take in country living at its finest. The charming bright kitchen with a view has beautiful upgraded granite counter tops, white cabinets and new top of the line stainless steel appliances. Three lovely bedrooms downstairs with a private master suite and study upstairs. The master suite has a cozy fireplace, upgraded carpeting, stylish bathroom with heated flooring, blue tooth, a spacious walk in closet and a private balcony over looking the amazing views of the canyons. This incredible home has a new high end roof, fresh exterior paint, dual pane windows, 4 wood clad sliders, upgraded and a new attractive garage door. The entertainers backyard has a beautiful pool, an nice waterfall that pours into a relaxing spa. The built in BBQ over looks the breathtaking views! Sitting on the lower acreage is a large easy care metal barn that has 4 horse stalls and corrals with a private office or tack room. The large pasture leads to numerous equestrian trails. Minutes away from shopping, award winning schools, major freeways and the renowned Sand Canyon Country Club with no HOA. The definition of serenity is right here at 16337 Ravenglen Road. Welcome HOME!" "Immaculate Sand Canyon single story home on a large view lot. This 3,200 sq ft, 4-bedroom, 3-bath home has been recently upgraded and features, custom mahogany leaded glass front doors, engineered hardwood floors, plantation shutters and upgraded lighting fixtures. The kitchen has a 10 long center island and flows directly into a large family room, making it perfect for entertaining. Appliances include a 48 Wolf range, 42 Sub Zero refrigerator, Wolf steam oven and wine/beverage refrigerators. The family room has a built-in entertainment center with a blue rock gas fireplace, 65 flat-screen TV and surround sound (included). Home has a formal living room and separate formal dining room. The master bedroom has vaulted ceilings, gas fireplace and a French door leading to the backyard. The large master bath includes custom vanity cabinets, marble countertops and flooring, a freestanding Kohler air tub, huge shower, large walk-in closet and a separate mirrored sliding door closet. Bedroom # 2 is currently used as an office, has a bath and French doors. The Jack & Jill bedrooms share a bath with custom tile, cabinetry and lighting. The laundry room has custom cabinets, plenty of storage, deep sink and a LG stacked washer and dryer. The home has a 3-car garage, dual air-conditioning units and a Life Source water filtration/softener system. The backyard boasts fabulous mountain views, patio covers, built-in gas BBQ, refrigerator, fire pit and koi pond. This home is a must see." 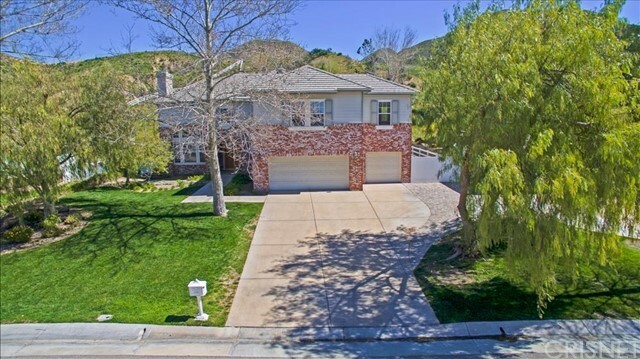 "Welcome to this stunning 5 bedroom, 4.5 bathroom, over 4000 sqft two story Cresta home in desirable Santa Clarita. Cresta at Aliento is a new home community, with several fully constructed homes ready for immediate occupancy. Stroll through your covered entry and open to soaring ceilings and a light and bright open floor plan. Gray wood like floor travel the entire lower level and recessed lighting is found throughout the house. The massive great room includes an oversized dining area, living space, huge kitchen, and a stacking slider to the backyard. The chef's kitchen is nicely upgraded with marble counters, white cabinets, huge island with stainless steel farmhouse sink, double oven, gas cooktop with hood, and walk in pantry. Desirable floor plan has a downstairs guest room with attached bath. Upstairs is a loft area with plush gray carpet great for a second living room. Master bedroom is spacious with double doors that lead to a private balcony that looks out to the hillside behind the house. Master bath has a large soaking tub, glass enclosed shower, dual vanities, and huge walk in closet. Secondary bedrooms each have attached bath. Upstairs laundry room. Private backyard is ready for your finishing touch. Move in ready! Welcome home!" "Turn key, single story ranch home, end of the cul-de-sac, all nestled on 1.4 acres of natural beauty. Great room open concept living with fireplace, sunroom and 4 bedrooms plus a converted family/den await. Updated gourmet kitchen perfect for all you needs. Energy efficient appliances and electrical updates all recently installed. Hardwood flooring throughout, all three bathrooms and plumbing have been renovated and lots of natural light flows through this home! 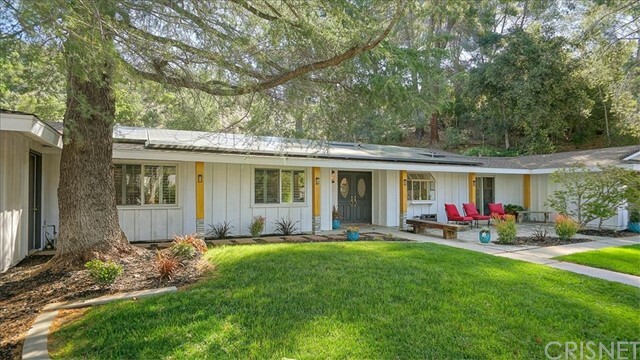 Truly a unique opportunity to enjoy the quiet, private Sand Canyon Woodlands neighborhood, while living in close proximity to LA. Tesla solar panels via Power Purchase Agreement. Two, two car garages (4 car bays) and plenty of garden space await your personal touch, a vineyard or expansion to suit your needs. A must see!" "Gorgeous luxury home located in exclusive Sand Canyon neighborhood, about 1 mile from Robinson Ranch Golf Course. Picturesque front yard with sunset view, mature landscaping and no neighbors across street. Almost 1 acre of land & approx 4,100 sf of living space. Wonderful, turnkey home. Ideal Floorplan. Double door entry welcomes you to beautiful foyer overlooking Formal Living Room featuring stately fireplace & expansive 2-story ceiling; open to spacious Formal Dining Room. Family Room w/ fireplace & custom built-in open to Kitchen that includes quality Sub Zero refrig/freezer, double ovens, center island, breakfast nook, and plenty of cabinets & counter space. Rich, hardwood flooring throughout most of main level. 2 Bedrooms, Bathroom & Laundry Room on 1st level. Impressive spiral staircase leads to true Master Suite featuring fireplace, huge walk-in closet, large retreat/bonus room & Bathroom w/ 2 vanity sinks, large garden tub & separate shower. 2 Additional Bedrooms, Jack-n-Jill Bathroom with dual sinks, Over-sized Bonus/Game Room with view & cozy Office upstairs. Beautiful back yard w/ tranquil mountain views, sparkling Pebbletech Pool w/ fountains and Spa. Perfect for entertaining or simply enjoying & relaxing. Huge side yard with newer Pavers. More than 55' RV Access. 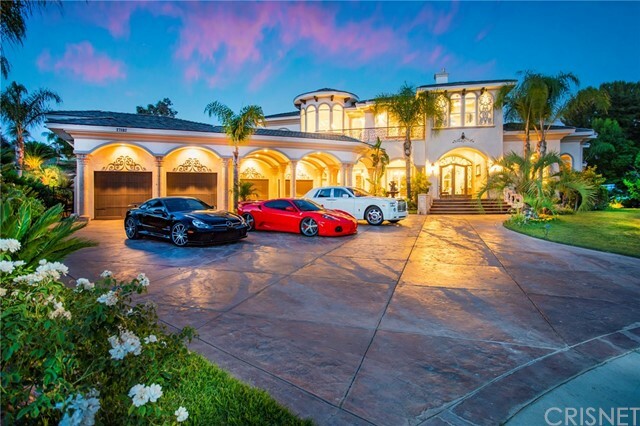 Super clean 3-Car Garage. Quiet neighborhood with walking & bike trails close and more! No HOA or Mello Roos. Excellent opportunity to live in gorgeous Sand Canyon neighborhood! A must see!"